A girl for all seasons: The importance of a good wing woman! Had a great time with Gerardine, reminiscing about our time in Abu Dhabi. We had been there about two months. Ramadan was over so nightspots were open again. It was a Friday night. The weekend there was Thursday and Friday, so like a dedicated teacher I was in my apartment getting ready for school the next day. Ger rang in a quandary. b) even if he did, he would have his friends with him. So obviously she needed a wing woman aka ME! The Marina Club was my favourite place in Abu Dhabi. It was outdoors, on the beach. So even when it was sweltering everywhere else, there was always a cooling breeze blowing. and I kept lookout and gave a running commentary. "Red alert. Red alert. 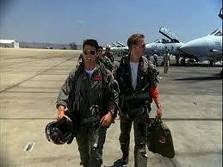 Target has just entered our airspace". Ger took big gulp of vodka and coke to calm her nerves. "Target has not spotted us yet. Radar must be on the blink". Dave gave a furtive glance around the place and spied the back of Ger's head. "We've been spotted. Target is honing in on our position. Dave and friend began to weave their way in our direction. "Update. Target has been intercepted by a group of colleagues at a table. He is now stationary". "Man your posts. Target is on the move again. More intent on destination this time". "Disaster. His wing man is trying to divert him off course to refuel at the other end of the bar". "Panic averted. Target is locked in on his target and is resisting". "Target is now directly behind you at twelve o'clock. Communication must now cease. Over and out". Dave tapped Ger on the shoulder. She turned and gave him a beaming smile. "Oh hi Dave. 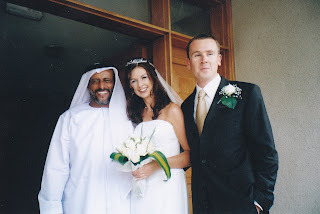 I didn't know you were here....."
Four years later Ger and Dave were married in Abu Dhabi. Don't you just hate it when someone turns up to a wedding in the same outfit as you...especially when you're the bride!